Wednesday is a busy night in the NBA, as eleven games are on the schedule. That gives us plenty of betting options to consider and it shouldn’t be too difficult to find a few winners tonight. You can bet on every game at TopBet Sportsbook tonight. New bettors will earn a 50% bonus for up to $250 plus active NBA handicappers will be eligible to receive a $10 free bet every Thursday. Memphis (10-1) is off to an incredible start, but the Raptors (8-2) have been as well. Toronto is 6-1 at home and the ACC has turned into one of the toughest places to play because of the rowdy fan base. The Raptors are going to be pumped about this game and will want to show up for their fans. Toronto is averaging 106.0 PPG (5th) thanks to consistent guard play from DeMar DeRozan and Kyle Lowry. DeRozan is scoring 21.2 PPG while Lowry is scoring 18.3 PPG. 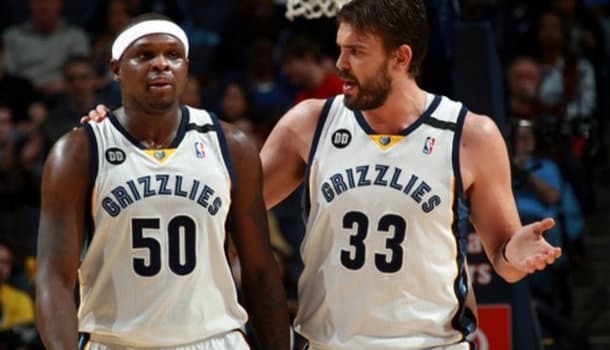 The Grizzlies only average 98.5 PPG (18th), but their big men (Marc Gasol & Zach Randolph) will have success in the paint against Toronto. Courtney Lee has been very productive for Memphis as well, so watch out for him. Both teams are in the T10 in points allowed and that’s why we’re getting a low total of 194 points. Take the over here. The Clippers (5-4) have been struggling to start the season, but they should be able to cover on the road against a weaker Magic (5-7) team. The Clippers SOS has been tough, but eases up a bit now. Orlando is playing better basketball right now, as they’ve won three of their last four. They were just able to dominate the Pistons (107-93), but the Magic are going to struggle against the Clippers. DeAndre Jordan and Blake Griffin should both have big games. Nikola Vucevic isn’t the best defender and the Magic lacks much size outside of him, so I can’t imagine they’ll contain the LAC big men. LAC is scoring 101.6 PPG (13th), but the problem has been defense (102.7 PPG – 21st). If they can limit the Magic’s offense (97.0 PPG – 22nd) to under their season average they’ll cover this small spread. The Cavaliers (5-4) just lost to the Nuggets on Monday, but prior to that they had won four in a row due to playing great offense. Cleveland is scoring 106.7 PPG (4th), but they give up 104.3 PPG (24th). San Antonio (6-4) has won four of their last five games and is playing much better than they were at the start of the season. However, three of the Spurs four losses have been on the road. The Spurs are relying on a solid defense (91.8 PPG – 3rd), but they’re only scoring 95.0 PPG (23rd) and that won’t cut it against the Cavaliers. Cleveland has too much offensive firepower. This is a game that the Cavs will want to win at home as well, as the Spurs are a respected opponent in the NBA. Lebron James will have a big game and the Cavaliers will cover, but not by much. There is a lot of action to bet on in the NBA tonight, but these are my best bets. I really like the over in the Raptors game and I feel confident that the two small favorites I bet will be able to cover also.